From left to right: Sue Lanham (2011 champion), Angus McDonald, Mark Kennel, John Karr, and Brian Smith. Picture above and account below courtesy Ron Secunda. A review of each RBN game played at this year’s tournament revealed some interesting observations of winner’s RR holdings. In the NE, 8 winners, held the PA, which is not surprising. However, the next most popular RR was the C&O, with 7 winners. The B&O was next with 4, and the NYC was last, with 3! In the SW, to no surprise, the AT&SF led with 8 winners, the UP 7, the WP 6, and the SP, which despites it’s highest price and far reach, still gets little respect – it only provided 5 winners. In the NW, the CMSTP&P led the pack for 7 winners, followed by just a few each for the GN and NP. In the SE, it’s no surprise that the SAL got high marks for 9 winners, but the L&N matched that number! The ACL and SOU each trailed with 4, and were even beaten out by the N&W and RF&P, which each helped 6 winners. In the center of the U.S.A., the C&NW had the highest count of all, helping 10 winners. 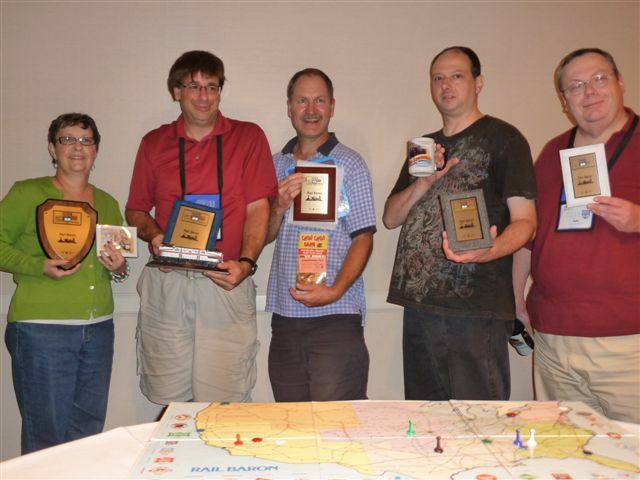 The D&RGW, MP, and GM&O each were held by 7 winners, the CB&Q 6, the SLSF and T&P each had 5, and the least- sought-after RR, the IC, was held by only 3 players. AH, you’re probably wondering about the remaining three RR’s. Well, the much sought-after NYNH&H and B&M did not seem to have much of an impact, helping only 4 players each to victory. The RR which had the poorest showing in the tournament was the CRI&P, which despite its high price and supposed desirability, was held by only 2 players. The Final game: As is often the case, the final Rail Baron game at this year's WBC was way more interesting than the average four-person game. Five players pretty much guarantees several players will be struggling, with a good chance of a few railroad auctions. Sue was the only player to take advantage of the home swap rule, changing her initial home city from Portland, OR to Oklahoma City. The remaining players’ Home cities, in turn order, were: John - Washington DC, Sue - Oklahoma City, Mark - Louisville, Gus - Kansas City, and Brian - Chicago. Gus was the first to make a major purchase, having arrived at Tampa from Kansas City. While he would have liked to purchase the PA, he was slightly more conservative and bought the NYC. He was not quite conservative enough, however, as his next destination could not have been much worse for him. He gave it a valiant try, but was not able to make it to Seattle before running out of money. He sold his NYC back to the bank, at a loss of $14k. Mark arrived in Butte, but didn't have enough to purchase the NYC. He bought the L&N instead; this made Nashville an unfriendly destination for Brian. Sue arrived in Portland, OR from Oklahoma City; allowing her buy the Pennsy. Gus then arrived in Seattle and promptly bought back the NYC. Mark completed his third trip (and first long one), and immediately invested in the B&O. Brian arrived in unfriendly Nashville, and bought the C&O, completing the sale of the main four Northeast railroads. The big Western railroads went un-purchased for a while. Gus was first, buying the AT&SF (he bought the D&RGW right afterwards). John bought the UP (which went well with his WP), and Sue got the SP right afterwards. This left Brian to buy the CRI&P on his next arrival. Mark was left out of the Southwest, except for El Paso, served by his T&P. Mark had to auction off the SAL before all the railroads were sold. Sue bought it, for $20k, and found it useful on later trips to Atlanta, Charleston, and Birmingham, though she had to go via the N&W. No one went to Miami during the game, however. Shortly after all the RRs were sold, Mark was forced to auction off the GN. Although this was his only railroad that reached the Pacific, it was not connected to his network, and so was not as useful as it might have been. Mark auctioned the GN for $30k to John. Gus was the first to announce that he had over $150k. As is usual in these tournament games, that meant that all the other players stopped riding his lines whenever possible. Sue benefited from that, and was the next to announce breaking $150k. None of the other players made it much past $100k, so the race was between Gus and Sue. Unfriendly destinations played a big role in the RBN final, as is often the case. Sue and Mark managed to avoid unfriendly cities for a while. In fact, of Sue's 16 destinations, only one was hostile (Spokane). Mark’s luck didn’t hold, however. Of his 21 destinations, 10 were hostile. This let Mark beat Brian in this un-contest, as Brian had "only" 8 hostile destinations out of 19 cities. John ended up with 3 hostiles out of his 12 destinations, and Gus had 6 out of his 16. The end was a bit anti-climactic. Gus did not have enough cash to declare for Kansas City when he was in Cleveland, so he rolled a new destination and got Jacksonville, which was unfriendly. Sue traveled from El Paso to Birmingham, and by this time, had accumulated enough money, and found herself close enough to make it to Oklahoma City. She “Declared” in Birmingham, needing a 9, and rolled an 11, paid the $20k in use fees, and ended with $231.5k in cash. The other cash totals were: Gus $194.5, Mark $102.5, John $21.5, and Brian $46.